After a few years developing our partnerships with Microfinance Institutions (MFIs) in developing countries, a new French partnership is now available on MicroWorld! 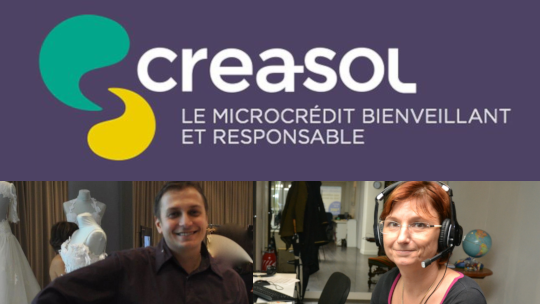 We are pleased to introduce Créa-Sol, a Microfinance Institution located in Marseilles. Créa-Sol – which is the contraction of "Crédit", "Accompagnement" and "Solidarité" (credit, support, solidarity) - was created in 2005 with the Caisse d’Épargne Provence Alpes Corse (CEPAC). Its aims at fighting financial exclusion and contributes to local economic development. Its clients are mainly based on the French Riviera but also in Corsica, the Reunion Island and Guadeloupe! Créa-Sol currently runs 5 agencies, employing 11 staff and supporting over 2,400 clients. Créa-sol contributes to local economic development by granting loans at market rate (around 5% annually in 2018) to those who cannot obtain loan facilities from the traditional banking system. Potential beneficiaries’ projects are analysed upstream, meaning credits’ disbursement depend on the quality of the project as well as the entrepreneur’s capacities to complete it. Créa-Sol grants professional and personal facilities, each with their own purpose. Personal microcredit mainly intends to promote employability (driving license, car purchase, training…) while professional microcredit directly sustains creating or developing a microenterprise. To help them complete their projects, the beneficiaries of professional microcredits can also benefit of an accounting and management support and are guided by the loan officers that are following the projects. Find out more about French projects to support on the MicroWorld platform! If you have any questions about this new MFI or partnership with Créa-Sol, please contact us at contact@microworld.org.